Enlarged view of the region in Orion which includes the Orion Molecular Cloud 2 (OMC2) – a small, dense cloud located within the much larger Orion star forming complex. 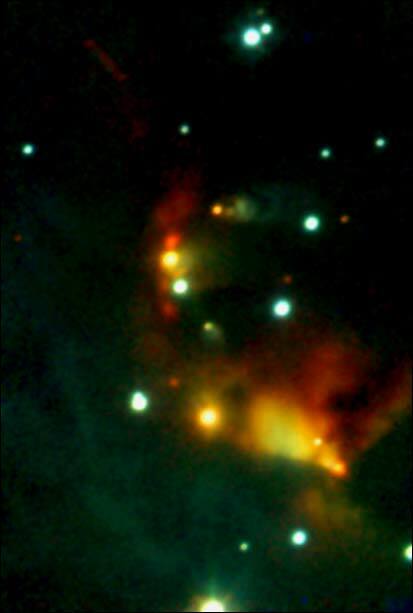 OMC2 is extremely young and contains a compact cluster of infrared sources. Throughout this image can be seen cavities and flow patterns in the nebulosity, giving clues to the structure and dynamics of this active star forming region. Telescope: 4-m; instrument: SQIID. Credit: NOAO. The Orion Molecular Cloud Complex is a giant molecular cloud of interstellar gas and dust in the direction of Orion, approximately centered on the Orion Nebula (M42). It is about 1,450 light-years away and measures about 240 light-years across. This giant cloud, or complex of clouds, of interstellar matter and young stars contains, besides M42 and the neighboring DeMairan Nebula (M43), and the nebulosity associated with them (NGC 1973-5-7), a number of famous objects, including Barnard's Loop, the Horsehead Nebula region (also containing NGC 2024, or Orion B), and the reflection nebulae around M78. Within this cloud, stars have formed recently, and are still in the process of formation. These young stars make up the so-called Orion OB1 Association. The association can be divided in subgroups: 1a, which includes and surrounds the stars of Orion's Belt; 1b, which lies northwest of the Belt stars; and 1c, which contains Orion's Sword. The stars of the Orion Nebula and of M43 form a subset of this group, and are sometimes separately counted as subgroup 1d – the very youngest stars of the Orion OB1 association. There are two major molecular clouds in the region. Orion Molecular Cloud 1 (OMC-1) is centered approximately 1' northwest of the Trapezium and contains the Becklin-Neugebauer Object and Kleinmann-Low Nebula. Orion Molecular Cloud 2 (OMC-2) is an infrared and molecular emission complex (see image right) about 12' northeast of the Trapezium, centered on a cluster of infrared sources. The result of a survey, carried out using the Spitzer Space Telescope, reported in 2006, revealed the presence of nearly 2,300 dusty disks in the Orion Complex, which could be the precursors of planetary systems. The disks, made of gas and dust that whirl around young suns, are too small and distant to be seen by visible-light telescopes; however, the infrared glow of their warm dust showed up easily using Spitzer's infrared detectors. Between 60 and 70 percent of stars in the Orion Complex appear to be accompanied by disks.